Jeff Schneider is President & CFO of Royalty Exchange which is an online marketplace where artists can sell a portion of their royalty stream to private investors as a way of raising money. They offer unprecedented flexibility that allows qualified sellers to dictate which the portion of their catalog they wish to sell while retaining full control of their copyrights and continue collecting the royalties they decide to retain. During the show, Jeff will discuss royalties as an alternative and modern opportunity for unaccredited investors. 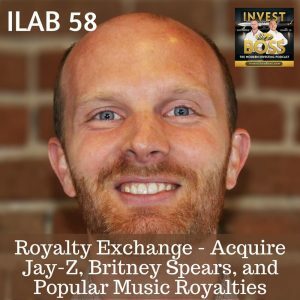 He will explain ways to get started investing in royalties, provide examples of the kind of music and royalties they sell on their platform including potential annual returns and quarterly payouts. Listen to ILAB 58 on iTunes here or subscribe on your favorite podcast app. 40:50 – What is a public performance? 49:12 – Will Johnny FD invest? 56:28 – Will Sam invest?